In 2011, having outgrown our Napa facility, Vine Jet began building a fist-class hangar facility for high-end aircraft. The result is a classic mix of form and function. Vine Jet isn’t a busy FBO, it’s a calm and relaxed environment for you and your jet. We have first-rate office, meeting and passenger lounge space, along with a spacious hangar. You’ll find exactly what you’re looking for with Vine Jet. Phil Gattuso has been a professional pilot since 1990 and holds the FAA’s Airline Transport Pilot Certificate with 13,000 of accident free flight hours to his credit. 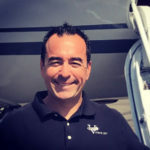 He is Type rated in Lear Jet, Westwind, Falcon 50/900 and Gulfstream II/III/IV and is passionate about flying Corporate Jets as well as Vintage Warbirds. In addition to his experience in multiple corporate jets, Phil has extensive flight time in Stinson L5, Marchetti SF 260, Grumman Albatross, T-28, T-6, P-51, A-26 and various other vintage aircraft. Phil is also a mechanic and holds the FAA rating on A/P (Airframe & Power plant). Phil’s professional flying career started in 1992 flying a Cessna 172 reporting traffic conditions along the 101 corridor for KZST, KJZY and KGO radio under the moniker of “Captain Phil.” He then went on to fly Lear Jets and Gulfstream’s for Clay Lacy Aviation from 1997-1999. Moving back to Northern California as chief pilot for Francis Coppola flying a Westwind II in1999. In 2002, Phil took the position of line captain for SK Aviation/Vine Jet on their Falcon 50 and he took over as Chief Pilot in 2008. Phil is married and lives in Healdsburg California with his wife Gina who he met in 1985 and they have two boys, Alex and Clay. Phil has been at the Santa Rosa airport almost every day since he showed up there as a volunteer back in 1989. If he is not on a trip, you will usually find him at the Vine Jet hangar during the week and on most Saturdays, at his personal hangar working or flying on one of his vintage airplanes. 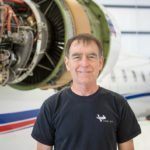 Steve has worked full time in the aviation industry for nearly 40 years, having worked as a professional pilot, a mechanic and a business owner. Steve holds an Airframe and Powerplant (A&P) mechanics certificate with Inspection Authorization (IA). He also has an ATP pilot’s certificate with type ratings in the following aircraft: Douglas DC-4, Lockheed L-18, Grumman G-III, North American B-25, Convair CV-240, CV-340, CV-440, G-II and G-III (G-1159A). He also has an “All Types” endorsement for high performance single and multi-engine experimental aircraft with experimental type ratings in the North American P-51, Hawker Sea Fury, North American T-28, BAC jet Provost and BAC Strikemaster. Steve was a FAA Designated Airworthiness Representative (DAR) for 10 years with the Van Nuys FAA Manufacturing Inspection District Office (MIDO). Steve started his aviation career at age 17 at the Sonoma County Airport in Santa Rosa working on and flying warbirds. He spent a few years working on GA aircraft earning his A&P certificate in the early 1980’s. His first flying job was towing gliders in PA-25 Pawnee’s. Next was 4 years flying DC-4, DC-6 and P2V-7’s fighting fires. He thought he wanted to be an airline pilot so he flew for American Eagle flying SA-227 Metroliners for 2 years. In 1992, Steve and a friend started Aerocrafters, Inc., specializing in the restoration of warbird and vintage aircraft with an FAA certified repair station for avionics. Aerocrafters evolved into Sonoma Jet Center in 2004 and became a full service FBO at the Sonoma County Airport in Santa Rosa. Presently, Steve is the COO of Vine Jet and still acts as the DOM (Director of maintenance) as well. Steve also fills in as a back up pilot for the Part 91 operations in the G-III, G-IV and Challenger 601. Steve has been happily married to Lori since 1991 they have one son, Sam who is currently playing College Baseball, Steve and Lori live in Windsor California. Steve’s hobbies include coaching/managing youth baseball, wood working, aircraft restoration, antique cars and traveling with the family. Ken has been a professional pilot for over 33 yrs. He holds the FAA’s Airline Transport Pilots Certificate with Commercial Glider endorsement as well as the FAA’s first class medical certificate. He has over 14,000 accident free hours, including extensive domestic and international experience. Ken is type rated in eight corporate jets including the Gulfstream III and GIV, the Dasault Falcon models 900ExEasy, 50 and 900, the Bombardier Challenger models 601 and 604, the British Aerospace Hawker HS-125-700 and 800 and the Citation 500. Additionally he is type rated in the Beechcraft KingAir turboprop model 300 and has extensive experience in numerous light twin engine and single engine aircraft and Gliders. Ken’s passion for aviation began at home in Hawaii, at the young age of 13 when he received his first ride in a Glider with the Civil Air Patrol, an auxiliary of the US Air Force. Convinced that aviation was to be his career, he joined the Civil Air Patrol and during his high school and college years earned his private pilots license in single engine aircraft as well as his commercial glider license. Concerned that the experience he was receiving in Hawaii would not give him the experience he would need as a professional pilot, he made the choice to move to Northern California to pursue his advanced training. After receiving his advanced ratings at Beechcraft West in Hayward California he began his professional career as a flight instructor and charter pilot with Beechcraft West in 1982. This led to opportunities with a number of San Francisco Bay Area companies and owners including Mr. Mervin Morris of Mervyn’s department stores, The GAP clothing stores, Mr. Thom Weisel of Montgomery Securities and Thomas Weisel Partners, and Mr. J Taylor Crandall of Oak Hill Capital Management. Ken has now been flying for the SK Aviation and Vine Jet since April of 2008. Ken’s outside interests include sailing his 41’ Sailboat ‘Manu Kai’ in the waters of the San Francisco Bay and the offshore areas of northern California, flying light aircraft, playing golf and spending time with his wife Cathy. 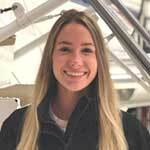 Karen has gained all of her training, experience and love for aviation while working with the Vine Jet team. Having quickly been promoted to Director of In-Flight Services, Karen is delighted to dedicate her substantial professional experience in hospitality and communication to Vine Jet and its guests. An extensive background in domestic and international flight services, a vast knowledge of food and wine, and a sincere dedication to creating a personalized experience for each guest sets Karen apart as a corporate flight attendant. Karen is dedicated to providing the highest level of service and safety, and strives to add those special touches that make flying with Vine Jet unforgettable. Karen has had safety training at CAPS and Flight Safety, and culinary and service training in Napa, Sonoma and San Francisco. Above all Karen enjoys what she does, the people she works for and with, and it shows in every detail of her work from the communication before the trip, to the personalized service while flying with Vine Jet. Prior to aviation Karen had a long career in wine and hospitality, and continues to teach Speech and Communication at the College level. When not flying or working for Vine Jet on the ground, Karen enjoys time with her two sons Declan and Collin, being with her family in the bay area, and playing with friends in her home of Healdsburg in the Sonoma County wine country. Gary joined the Vine Jet team in March 2017. He has been flying professionally since 1977, and holds an Airline Transport Pilot Certificate with type ratings in CE-500, CE-650, CE-750, and CL-600 aircraft. Gary also holds a Gold Seal Flight Instructor Certificate and a Ground Instructor Certificate. He has 14,000+ hours of accident- and incident-free experience. Gary learned to fly at Hamilton Air Force Base as a member of the Aero Club while attending The University of California at Berkeley. 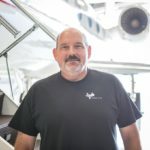 Upon graduation from Cal, while employed as a civil engineer, he began his advanced flight training at Sonoma County Airport with Let’s Fly, Inc. Gary was then hired by Let’s Fly, Inc. as a full-time flight instructor and air taxi pilot. During this period Gary also taught ground school at the Santa Rosa Junior College. Gary was introduced to turbofan aircraft while working for Craig Schulz of Woodstock Aviation flying a Citation 501 (flight department motto: “We fly for Peanuts”). 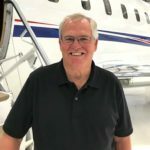 Two years later, Gary was hired by Korbel Champagne Cellars as a captain on their new Citation 550 aircraft, then served as Chief Pilot for their Citation 650 and 750 aircraft, holding the position with Korbel for over 30 years. Leisure time activities include reading, hiking, kayaking, traveling with his spouse, Jani, assisting former students with currency requirements, and coming to terms with his Border Collie, Cooper. Gary and Jani enjoy time with their daughters and families, including young grandsons, Rye, Korbin, Emmett and Alberto. Patrick Valenzuela has been flying professionally since 2004. He holds an Airline Transport Pilot Certificate and has over 6,000 accident- and incident-free hours. He is type rated in the G-IV, EMB-135/145, as well as SIC in the CL-65, CL-600, and Citation II. Patrick has numerous hours in light twin-engine and single-engine aircraft. Patrick’s passion for aviation started at a young age in Southern California when he and his parents would go down to the local airport to watch airplanes in the pattern do touch and go’s. He has he loved the idea of flying professionally ever since. Patrick studied at San Diego Mesa Community College in Aviation and took flight lessons out of Montgomery Field. He graduated with an Associate’s Degree in Aviation Flight Operations and transferred to San Diego State University shortly after, where he received a Bachelors in Public Administration. After he received his advanced ratings, he started as a flight instructor out of Carlsbad McClellan-Palomar Airport. During that time, he was flying a Citation II which led to his next job with ExpressJet Airlines where he worked for the next 9 years. 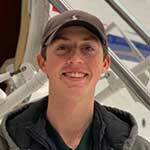 Patrick relocated to Northern California where he currently flies the two G-IV’s and the Bombardier Challenger 601. Patrick currently lives in Cloverdale, California, with his wife Cinnamon, son Cole, and three daughters, Kayla , Kari , and Cambria. In his spare time, Patrick enjoys surfing, snowboarding, dirtbike riding, golfing, hunting, fishing and camping with the family. He is also involved with the Pilots for Kids Foundation and helped formulate the San Diego chapter. Bruce has over 40 years experience in aviation. Born in Santa Rosa, Bruce’s interest in aviation piqued because of his father’s aviation hobby. Bruce started taking flight lessons at the Healdsburg Airport at the age of 15. He worked 10 years at SIS-Q Flying Service as a mechanic working on DC-6 and S2F fire bombers, C-402 Pilot and as a DC-6 Pilot fighting fires. In 1990, he began working for United Airlines where he was a mechanic for 25 years. Bruce holds a Commercial pilots certificate with single and multi-engine instrument rating. He is type rated in the BAC Jet Strikemaster, Supermarine Spitfire and holds SIC type ratings in the Challenger 601 and Gulfstream G-IV. He also has been a certified A&P mechanic with Inspection Authorization for over 35 years. Vine jet was able to recruit Bruce to the team in 2015. Even during his free time Bruce likes to restore and fly older planes. Bruce and his brother Dave own and are restoring a WWII FG-1D Corsair. Bruce is married to Kathy and the two of them enjoy adventures together like mountain climbing, scuba diving and traveling. Bruce has 2 stepchildren, 5 grandchildren and has lived in Healdsburg since 1988. Kent started his aviation carrier at the age of 13 working for his father at an FBO in southwest Kansas. Kent has worked as a diesel mechanic on over the road trucks and while attending Colorado Aero Tech in Broomfield Colorado to earn an A&P certificate in 1988. Kent went to work for United Airlines in 1989 in San Francisco and spent the next 28 years working all the different aircraft in United’s fleet. After retiring from United Airlines Kent came to Vine Jet October 1, 2016. Kent became a privet pilot in 1995 and continues to enjoy flying and working on all sorts of aircraft. Nadia Wilke was born and raised in Northern California. She is beginning her second year of college, attending Santa Rosa Junior College. Nadia grew up around small aircrafts, flying with her dad in his Cessna 206, and Husky Amphib. Nadia has always enjoyed international travel, including a summer trip to Europe as a student ambassador and a semester abroad in New Zealand. She also enjoys scuba diving, snowboarding, living an active lifestyle, and is an avid foodie. Nadia is enthusiastic about the unique experience of becoming a member of the Vine Jet team. Jack Adams was born and raised in Sonoma County and graduated from Windsor High School in 2018. Jack was a boy scout for over 11 years and in May 2018 achieved the rank of Eagle Scout, the highest rank in Boy Scouts. He is interested in aviation and hopes this job will teach him more about the field before he begins classes to get his private pilot license. On his free time Jack likes to camp, skateboard, and hang out with his friends.